The most significant and detailed multi-year study into bicycle rider crash statistics ever undertaken in Victoria has found that fatalities involving bike riders are decreasing, however non-fatal crashes are increasing, something the Amy Gillett Foundation is working hard to address. The Amy Gillett Foundation report , by researchers Megan Garratt, Marilyn Johnson and Jacinta Cubis analysed all police-reported bike rider crashes in Victoria from January 2002 to December 2012. While it is widely accepted that the number of people in Victoria choosing to travel by bike to work, for sport and for fun is increasing, the number of bike rider crashes is also increasing. With more than 1.08 million Victorians riding each week (Victorian Government 2012), bike riders have a significantly higher crash risk compared to vehicle occupants. The study found there are distinct differences in the crash profiles of fatal bike rider crashes compared to non-fatal crashes: the highest proportion of bike rider crashes occur in urban areas yet almost half of all bike rider fatalities occurred in regional areas. A quarter of bike rider deaths were caused by rear-end crashes with more crashes of this type than any other single crash type. On average bike rider crashes account for 8.8% (police data) and 17.2% (hospital data) of all road crashes. 75% of bike riders involved in a crash were wearing a helmet. 9% of all non-fatal crashes were a result of a ‘dooring’ by a driver or passenger with this increasing over recent years. 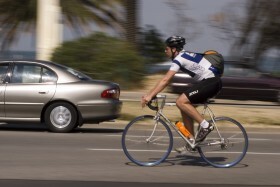 However in the City of Melbourne – dooring was the most common cause of a bike rider crash. Where speed zones were recorded, the majority of all bike rider crashes (77%) occurred on 50kph or 60kph roads. Most crashes occurred on Tuesday followed by Thursday. Amy Gillett Foundation interim chief executive officer Belinda Clark said the study confirms that there are distinct differences in the crash profiles of fatal bike rider crashes compared to non‐fatal crashes. These factors need to be taken into account when considering investment in action to improve bike rider safety. There are limitations in the conclusions which can be drawn from CrashStats data, most notably the lack of exposure data. However, despite its limitations, the report provides the most comprehensive data source of road user crashes. No other publicly available and routinely published data provides the same level of detail about crash circumstances. The findings allow the Amy Gillett Foundation to develop theories about what might be going on and to focus our research on those possible causal factors and to continue to push for change for bike rider safety. The project was funded by a Community Road Safety Grant received from the Transport Accident Commission.